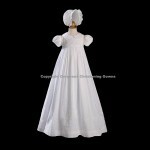 A beautiful full length 28” 100% Silk christening gown with short puff sleeves, which are gathered with banded cuffs. The bodice is set-off with intricate lace detailing. The hem of the skirt is straight. Pearl buttons down the back of the bodice and a large sash tie make the back beautiful to. 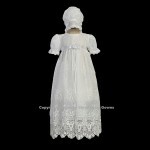 This dress is fully lined for your little girl’s comfort for christening or special occasions. 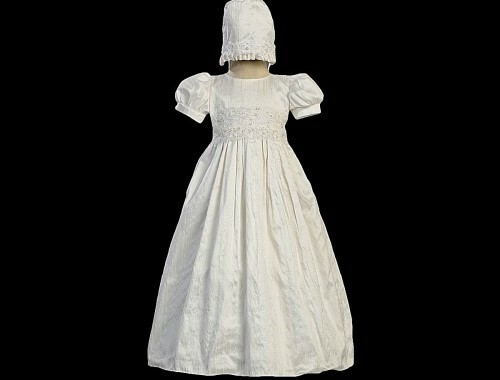 The bonnet is detailed with embroidery and ruffled trim. 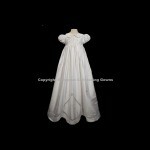 This christening gown is fabricated from 100% silk and is slightly off-white in colour. NOTE: Raw silk is a natural fabric with variation in the “slubs” as it is woven. The inconsistencies add to the charm of the fabric and are in no way considered flaws.